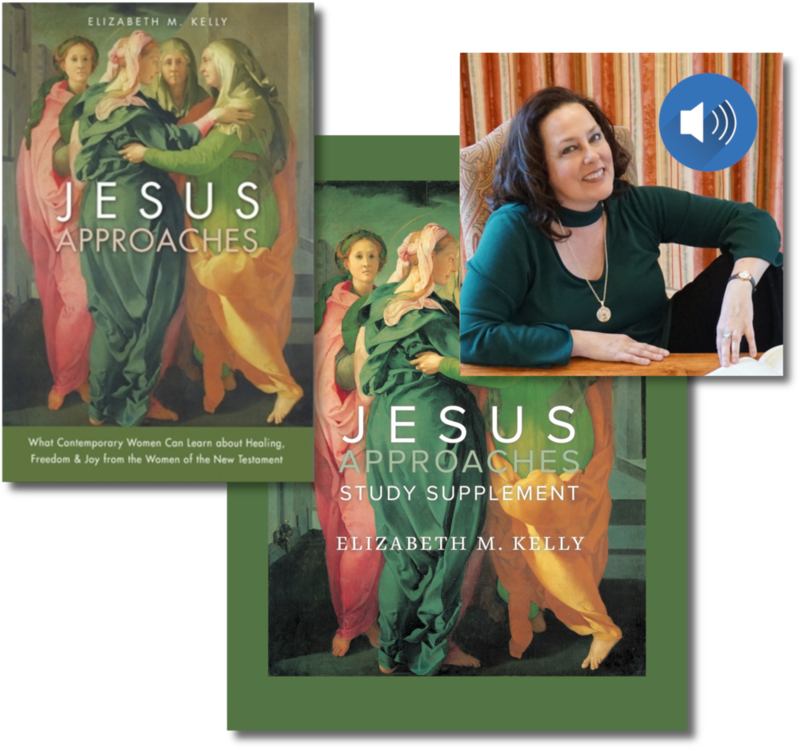 In her book Jesus Approaches, award-winning Minnesota author Liz Kelly shares vivid stories of New Testament women whose encounters with Jesus freed them to flourish in life. The stories are supplemented with moving accounts from her own life, and from the lives of women like you, to demonstrate that sometimes the best way to find healing, strength, and wholeness in Christ is, ironically, to lead with vulnerability and openness. The Jesus Approaches “Take-Home Retreat” guides individuals or groups through the book in eight contemplative sessions. 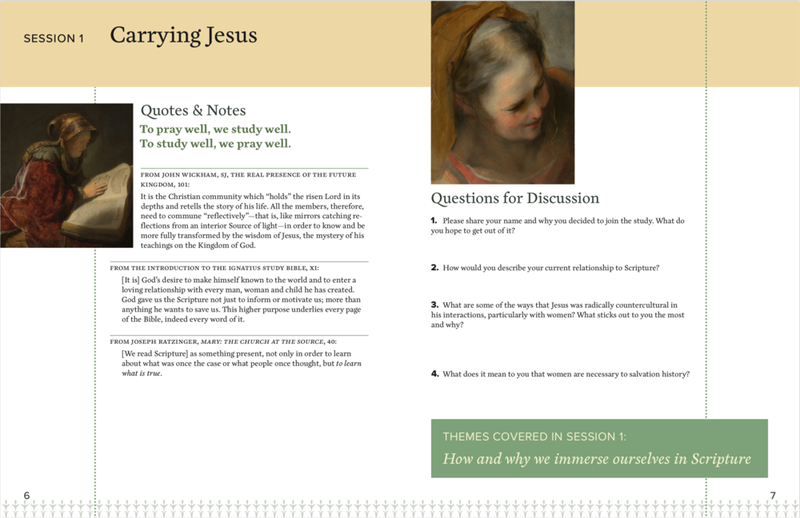 Each session includes a 40-minute talk by Liz, which is accompanied by the quotes, insights and discussion/journaling questions in the Study Supplement. Whether you are a group of five meeting in someone’s home, or a group of 200 meeting in a parish, the Jesus Approaches Take-Home Retreat is designed to help every woman grow in confidence as she prays with Scripture and to enter more deeply into relationship with Christ. Each session begins by listening to a 35-45 minute talk by Liz, and then breaks into small groups for sharing, discussion, and sisterhood. We plan sessions to last about 90 minutes, but you can adjust that to meet the needs of your group. The $60 per person cost includes a book, study supplement, and audio access for each participant. Contact us for large group discounts. 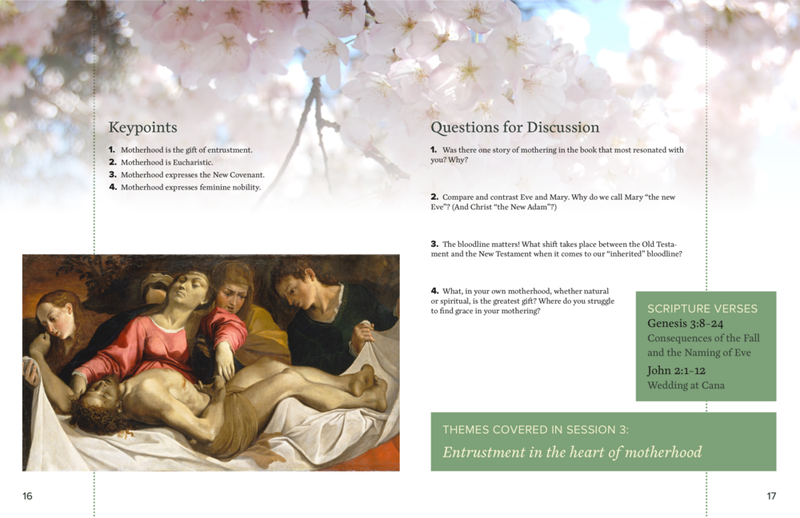 Supplement contains key quotes, reflection questions, and more for each session. Guidelines to maximize the quality of your small group discussion. Free promotional materials to help you advertise. Option to invite Liz to come launch the retreat in person. + What's in the supplement? The Supplement is exactly that—supplemental material to the book. It does not simply review or rehash every chapter. Rather, each session is meant to expand on the themes of the book, to offer an even fuller experience of the Jesus who teaches, forgives, heals, and saves us—and then sends us out as his witnesses. The following are suggestions on what a week with the take-home retreat might look like for you. The reading assignments for each week are listed in the Contents, and they are repeated at the top of the page of each session. You’ll read the assigned chapter or chapters, paying special attention to those things in the writing that strike you in some way. You might want to make notes or highlight passages that you want to discuss in small group. Christ Encounter: Each chapter has at least one guided prayer opportunity with scripture titled “Christ Encounter.” Many women report that doing this prayer assignment in adoration is especially helpful. Appendix C offers simple tips on how to pray with scripture if you have not done so before. Scripture Verses: Each week we will examine a few scripture passages in greater depth. You can find these verses in the green boxes in your supplement. To prepare for the talk that will be given each week, we recommend reading through the Scripture verses that are listed before class, maybe the evening before, so that they are fresh in your mind. Quotes & Notes: The supplement provides some of the “beefier” quotes from the talks for you in the Quotes & Notes section, so you don’t have to worry about writing everything down. You are not required to read them before class, but you might find doing so helpful. Keypoints: The Keypoints offer a quick review of some of the main points from the talk each week. Questions for Discussion or Journaling: There are questions for discussion at the end of each chapter in the book, but we’ve also included them in your supplement. The questions in the book are for groups that are meeting independently and do not access the talks. The questions in your supplement include those from the book and additional questions for our study. You are free to discuss anything that comes up for you in your small groups and you are not limited to the questions listed. The questions provided are simply meant to direct conversation and help you to approach the material. It is not required that you answer each question. Each talk is posted online. We highly encourage listening to the talk at home to reinforce what you’re learning. All of the artwork has been selected to emphasize the themes of each week. We invite you to pray with these images if you’re feeling stuck in your prayer. Beauty often guides us to the eternal. By spending time with Christ in his Word and prayer and with these women who came to know him in such powerful and personal ways, I pray you will grow in knowledge of God’s infinite love for you, his enduring mercy, and all-encompassing grace. He sees your soul perfectly, knows it completely, and loves it without reservation. Indeed, he knows you by name. He knows you by heart. + How will we access the audio? Once you purchase the study, you will receive login information for the exclusive content page. This page contains the audio links, marketing materials, and more! I keep this quote in my office and I read it before every meeting I have, especially with directees. Your small group and everyone in it comprise sacred ground. Listening as others share their prayer and study experience is a holy task—and one you will find brings much grace to your own soul. No question is too basic or silly. We can approach Jesus as little children who need much guidance and instruction. Your small-group leader will help to guide conversation and keep your group on topic. Please be respectful of the commitment she has made to you. Advice-giving should be avoided in small groups. Let the Holy Spirit do his work in each member. Small-group discussion should be kept confidential. Please help to create an environment where members feel free and comfortable to share their interior movements of heart or wrestle with questions they have. Your group may have many levels of life experience in prayer, study, and the life of faith in general. We are one body in Christ and meeting others with vastly different perspectives is a blessing and an opportunity to grow and learn. Even if you are unable to complete your assignment, join us anyway. Know that you are welcome and wanted. These promotional materials are available once you purchase the take-home retreat, on the exclusive content page. + Interested in Liz coming to launch the retreat in person? When you purchase the group take-home retreat, you will have the option of expressing interest in having Liz come to your location to launch the study in person at an additional cost. If you are interested, Liz will be in contact with you. You can also contact her directly for more details. She would love to hear from you! Even if you’re in a remote part of the globe, you can walk with Liz through the Jesus Approaches Take-Home Retreat and reap the full benefits of praying with Scripture and learning more about the women of the New Testament. One woman described her experience this way: “This book has helped ignite my prayer life at a time when I didn’t even realize the flame was low. It breathed fresh life into Gospel stories I thought I knew inside and out. Moreover, it brought these stories into my life, speaking to me personally in ways I’ve seldom experienced.” Each session begins by listening to a 35-45 minute talk by Liz, and then offers questions for journaling. We plan sessions to last about 90 minutes, but you can adjust that to meet your personal needs. Suggestions for getting the most out of your personal journey through this take-home retreat. Ways to connect with Liz as you go. Each talk is posted on-line. We highly encourage listening to the talk at home to reinforce what you’re learning. + How will I access the audio? Once you purchase the take-home retreat, you will receive login information for the exclusive content page. This page contains the audio links, "Prayer Basket," and more! If you would like to connect personally with Liz as you walk through this retreat to share how it has impacted you, please feel free to contact her. You can also submit prayer requests in the "Prayer Basket" on the exclusive content page, and Liz will bring these intentions before the Blessed Sacrament.